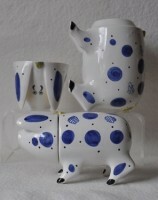 The highly collected Sussex Pig has been made by Rye Pottery for over 200 years. A charming and traditional wedding or anniversary gift from Sussex, this vessel was originally designed as a jug (the body) and cup (the head) to toast the bride and groom at country weddings in the 1800s. In a county renowned for its pigs and boars, guests were rewarded with a hogshead of beer. 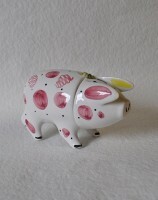 Today we make large and small Sussex Pigs in pink, blue and black and they're exclusively available direct from us. Click on the pictures below to see them in all their quirky splendour! To order a pig you need drop us an email at sales@ryepottery.co.uk and we'll send you a secure online payment link or give us a call with your card details on +44 (0)1797 223038. 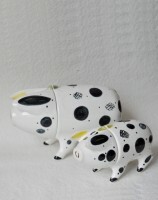 Small Pigs £67.00 - Large Pigs £112.00. All pigs come with a card explaining their origins.